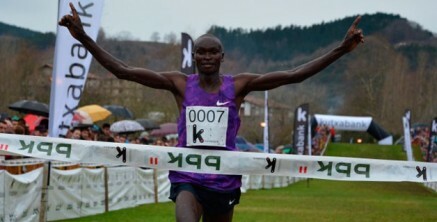 10th January 2016 – Thomas Ayeko (UGA) began his 2016 in fine style by taking a convincing win at 62nd International Cross Zornotza in Amorebieta, Spain. The race was a Ugandan battle up front as Thomas battled with fellow PACE athlete and the defending Champion Timothy Toroitich (UGA) and Moses Kibet. Thomas was the strongest in the latter stages winning the 9.5km event in 29:33, 14 seconds ahead of Timothy who still took 2nd. At the Great Edinburgh Cross-Country double Olympic and World Champion Mo Farah (GBR) opened his 2016 campaign with a second place finish in the mens 8km race. In his first cross-country race for five years Mo found the heavy underfoot conditions tough going but still led Great Britain to victory in the team event. Stephanie Twell (GBR) ran a strong second leg for the Scottish quartet who won the inaugural Stewart Cup 4x1km relay. Michael Rimmer (GBR) was part of the British team to take 2nd. Earlier in the week Linet Masai (KEN) placed 3rd at the Campaccio Cross-Country near Milan.